FIGURE 17.5.1.- The condensation process. 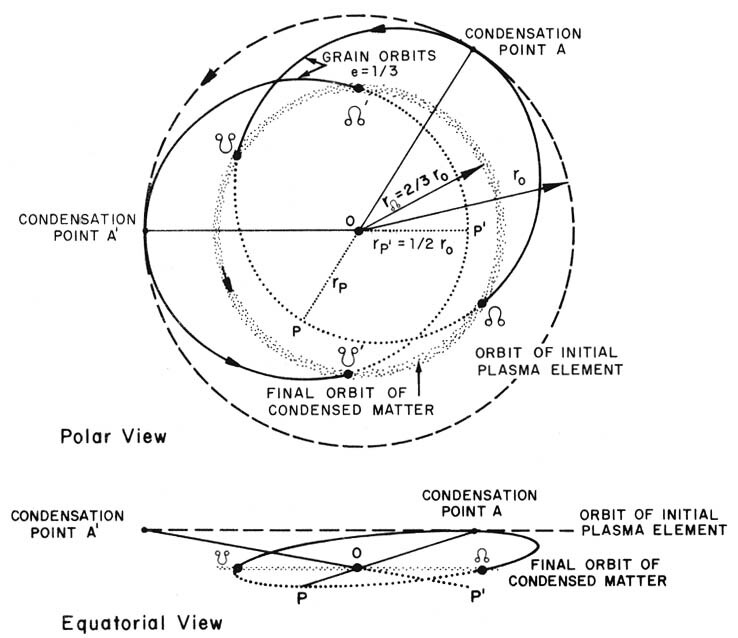 The outer dashed line represents the circular orbit of a plasma element in the partially corotating plasma. Condensation produces small solid grains which move m Kepler ellipses with eccentricity e = 1/3. Two such gram orbits are shown, one originating from condensation at A and the other, at A'. The condensation point A, which hence is the apocenter of the former orbit, has the spherical coordinates . The pericenter P is at , and the nodal points are at and . Collisions between a large number of such grains result in the final (circular) orbit of solid particles in the equatorial plane The eccentricity 1/3 of the initial gram orbit and the radius 2r0/3 of the final orbit of condensed matter are direct consequences of the plasma being in the state of partial corotation (see sees. 17.3-17.5).